1) Some people take their feeders down until the flocks go away. If you don’t want to feed the hoard, this is the way to be 100% effective. Put the feeders back up when the weather warms up. For myself, I can’t do it because I don’t like leaving my regular birds without this up-until-then reliable food source at a time of year when native foods tend to be scarcer. 2) Feed the birds as usual but go outside when the flocks descend. Be present. Don’t scream and shout. Just stand in the feeder area for a few minutes. Usually the flocks are not super patient (they have a lot of mouths to feed after all) so if you stand there for a few minutes, they are likely to move on. If they haven’t, then try clapping loudly a few times. They will probably move off, except for the starlings which are incredibly tenacious. If it is cold, especially if there is a late snow, the flock will probably be back again after awhile. If you do this repeatedly, there is a chance they won’t return the next day. Or they will. If they haven’t found an alternative food source in those periods when you’ve sent them on their way, they’ll be back to your feeders. Rinse and repeat. 3) If you are offering mixed seed that contains millet, milo and corn that these flocks especially like, stop. Also when the flocks are active, try to avoid broadcasting seed on the ground; it is attractive for feeding a large flock. If you want to continue to offer these types of seed, at least contain it so they don’t have a wide area in which to spread out to eat, making it that much more attractive to them. 5) Try a different style feeder. Open platform feeders are wonderful for many types of birds (including Northern Cardinals and Mourning Doves who both love them), but they are also especially welcoming to the big mixed flocks this time of year because they can accommodate so many birds and fit their preferred feeding style. Hopper feeders can also be fine feeders, but this time of year, the starlings are likely to use their beaks to sweep the seed out of the tray onto the ground for the squirrels to eat, emptying out the feeders quickly. 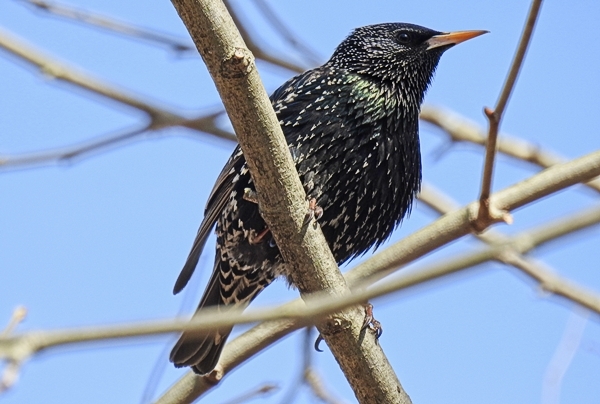 European Starlings seem to have more trouble getting seed out of deep narrow tube feeder ports, so they might be less of a pest on them. The ones in my yard are mostly on the platform feeders rather than the tube feeders. 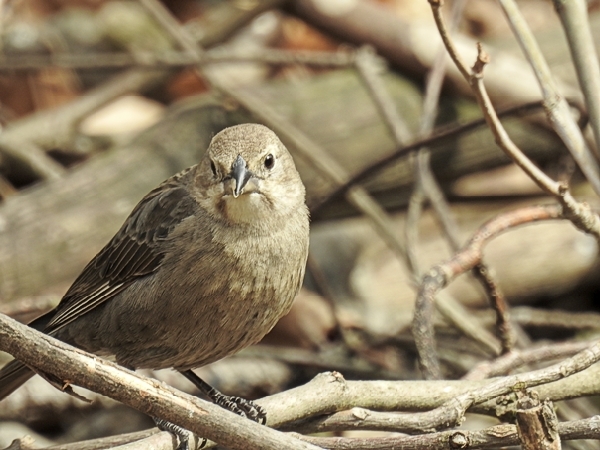 (They liked the hopper feeders too and kept dumping out the seed until I tweaked those feeders.) 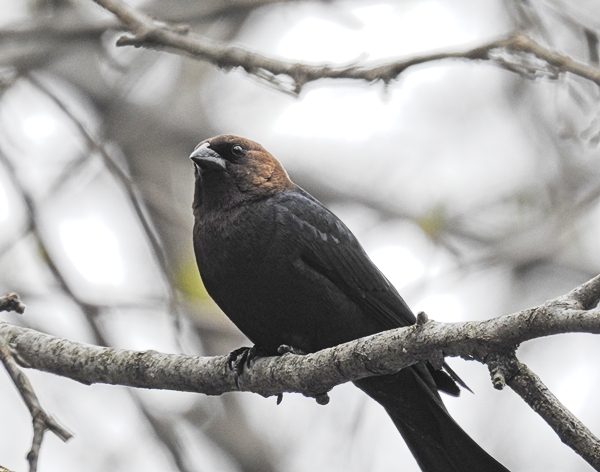 The Brown-Headed Cowbirds in my yard always seem to be on the ground or in the platform feeders; I don’t think I’ve seen them on the tube feeders . . . which doesn’t mean they won’t, if that is the only option. 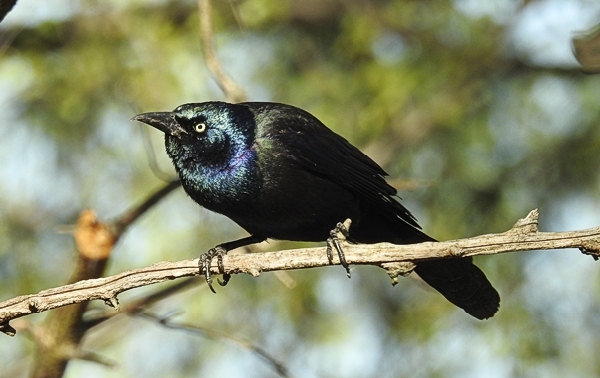 Common Grackles and Red-Winged Blackbirds are usually fine with tube feeders though. BUT, you might try shortening or removing the perches temporarily if your feeder allows that. This might make it harder for bigger birds, while many of the smaller birds can use shorter ports or cling more easily. I took the perches off a Squirrel Buster Classic feeder and the grackles will occasionally visit it, but can’t stay long because they have trouble hanging on for long. 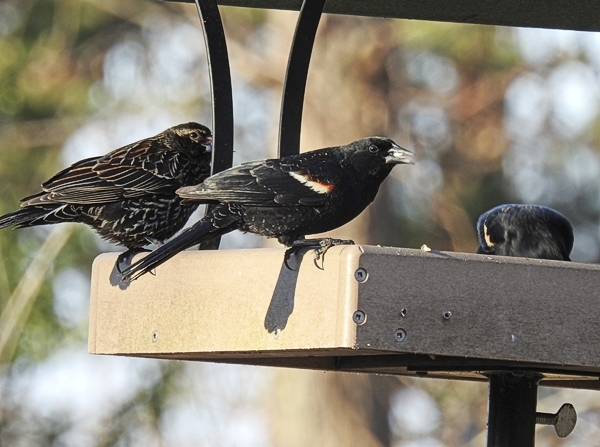 If the starlings and grackles are eating all your suet and won’t let other birds have a chance, consider using an upside-down suet feeder. These birds will learn to dangle to grab a bite but they can’t keep it up long enough to dominate the feeder and eat it all. Even better for the smallest birds though is a cage-style feeder. The openings between the bars only allow smaller birds through. I have three cage feeders that are popular for American Goldfinches, House Finches, Purple Finches, White-Breasted Nuthatches, Red-Breasted Nuthatches, Pine Warblers, Carolina Wrens and Carolina Chickadees. The larger flock birds can’t get in, but neither can larger birds like Northern Cardinals. Larger birds may try to dangle on these feeders briefly to try and nab a seed but if the seed ports are far enough away from the cage surface, they shouldn’t be able to get in and will usually give up fairly quickly. 6) Repeat to yourself over and over again: “This too shall pass” when the nuisance birds are driving you crazy. This period is usually just a few weeks long. Once the weather warms up a bit, the bugs will be more active and those birds are likely to be much less present at your feeders. 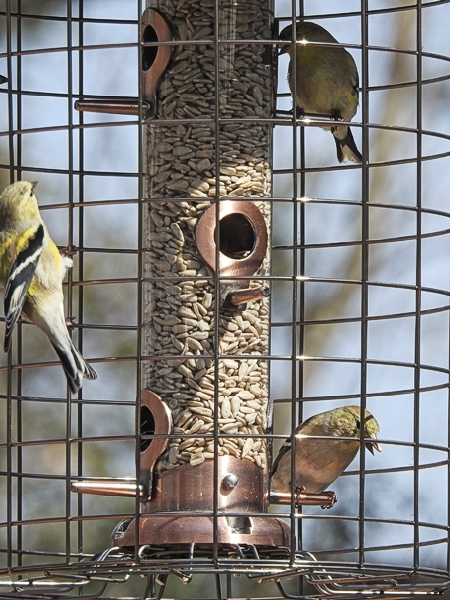 How are your feeders doing this spring? Are the flocks driving you crazy? Hi Brian, I do think that when the big flocks come, many of the less dominant birds back off and aren’t at the feeders as much, but they will come back when the flocks are gone. I used to bang on the windows too (especially back when the squirrels would get in the feeders) but I decided that I was scaring all the birds off when I did that. If I instead went outside to move them off, even if in the end I need to clap my hands, the regular birds see that I am the source of the noise and often come back to the feeders right away. They know me and that I’m not really a threat (but the big flocks don’t know that) and I think the regulars understand that I’m trying to get rid of the flock, so they take advantage of the window I’ve given them to eat at the feeders in peace. I think when I was banging on the windows, it wasn’t always obvious to them what the sudden noise was and they would get spooked too. But anyway, this is just what happens this time of year. It makes me crazy at times, but it’ll pass. The flocks keep it interesting this time of year. I have one small hopper and tray feeder that I use sparingly this time of year. Usually fill them late in the afternoon and watch the cardinals. The tube feeders are in cages until summer. I can’t keep them filled right now. This seems to be the busiest time of year for the gold finches. They’re so hungry. Recently purchase a suet feeder in a cage for the Downy, Nuthatch, and Chicadees. I think I’ve noticed some of the flock eating Safflower since that’s mostly what I’m offering in the trays feeders. I’m going to try a new suet feeder this weekend that looks like a log. I put up a small window feeder last weekend that has been fun to watch. So far the flocks haven’t noticed it. Fingers crossed. Hi Tim, I think you are going about it in a good way. It doesn’t have to be fill every feeder or fill none. Sometimes it is easier to put a feeder away for awhile than fight it. (I’ve done that with my hopper feeders right now for the same reason.) Timing the feeding of the cardinals is a smart idea. My goldfinches are in a feeding frenzy too. I’ve got three cage feeders filled with sunflower hearts right now and they are super popular with American Goldfinch, House Finch, Carolina Chickadee, Carolina Wren, White-Breasted Nuthatch, Red-Breasted Nuthatch and Pine Warblers. In my yard, all of these same birds except for the American Goldfinches and Red-Breasted Nuthatch will also eat safflower sometimes and the House Finches eat safflower a lot. I’ve just started experimenting with a Squirrel Buster Classic tube feeder with the perches removed and I’m really pleased with it so far. This one has wire mesh over the tube that lets clinging birds use it easily. It appeals to all of the same birds that use the cage feeders. 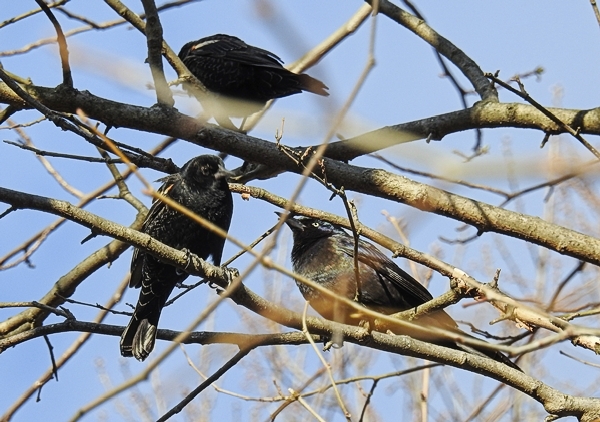 Even though it isn’t inside a cage and is full of sunflower hearts, the only flock bird that gets on it so far is the Red-Winged Blackbirds and they seem more comfortable eating safflower from the platform feeders so mostly leave it alone. I watched a couple European Starling try it but they said, “Nah, we don’t like the little ports” and moved on to another feeder. Yes! It’s only been a few days, but so far so good with this feeder. Feeding birds is like a puzzle with lots of moving parts!